Instead of directly measuring the pressure in each tire, the TPMS on this vehicle monitors and compares the rolling radius and rotational characteristics of each wheel and tire while you are driving to determine if one or more tires are significantly under-inflated. This will cause the low tire pressure/TPMS indicator to come on and a message to appear on the multi-information display*. The system does not monitor the tires when driving at low speed. • Warm weather can become under-inflated in colder weather. • You rapidly accelerate, decelerate, or turn the steering wheel. • You drive on snowy or slippery roads. • Snow chains are used. • A compact spare tire is used. • There is a heavier and uneven load on the tires, such as when towing a trailer, than the condition at calibration. • Adjust the pressure in one or more tires. • Replace one or more tires. • Set the cold tire pressure in all four tires. • The vehicle is at a complete stop. • The shift lever is in (N.
• The shift lever is in (P.
• The ignition switch is in ON . 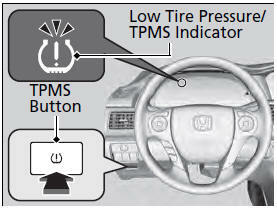 Press and hold the TPMS button until the low tire pressure/TPMS indicator blinks twice, indicating the calibration process has begun. • If the low tire pressure/TPMS indicator does not blink, confirm the above conditions then press and hold the TPMS button again. • The calibration process finishes automatically. You can calibrate the system from the customized features on the multi-information display. 1. Press button to select Vehicle Settings, then press the SEL/RESET button. - TPMS Calibration appears on the display. 2. Press the SEL/RESET button. - The display switches to the customization setup screen, where you can select Cancel or Calibrate. 3. Press the button and select Calibrate, then press the SEL/RESET button. - Calibration Started screen appears, then the display returns to the customization menu screen. • If the Calibration Failed to Start message appears, repeat steps 2-3. • TPMS cannot be calibrated if a compact spare tire is installed. • The calibration process requires approximately 30 minutes of cumulative driving at speeds between 30-60 mph (48-97 km/h). • During this period, if the ignition is turned on and the vehicle is not moved within 45 seconds, you may notice the low tire pressure indicator comes on briefly. This is normal and indicates that the calibration process is not yet complete. You can calibrate the system using the audio/ information screen. If the snow chains are installed, remove them before calibrating the TPMS. If the low tire pressure/TPMS indicator comes on even when the properly inflated specified regular tires are installed, have the vehicle checked by a dealer. We recommend that the tires be replaced with the same brand, model, and size as the originals. Ask a dealer for details.